For large fields, or reservoirs where only certain wells are expected to sour in the course of their production life, it may be possible to meet gas quality limits by the dilution of sour production with sweet fluids, thus eliminating the need for any treatment facilities. Alternatively, in some cases, it may be more cost effective to shut-in particularly sour wells or to abandon gas export in cases where the lost production has a lesser economic impact than increasing gas treatment capabilities or changing out sweet service materials. Some of the alternative approaches to gas and fluid sweetening include liquid H2S scavenger injection into the production system, solid reactants, and regenerating systems. These scavengers can be applied directly into the well, at the wellhead, or on the topsides. Liquid scavengers have also been applied through gas lift systems in the absence of dedicated injection lines. Liquid scavengers in downhole or subsea environments in oil production systems can become very inefficient. This inefficiency is driven by two factors, the first being the ability of the scavenger to mix into the fluid stream and the second being that all the production is treated when it is generally only necessary to reduce the H2S content of the gas phase. The efficiency of subsea scavenger injection is typically not sufficient to reduce souring levels down to those required for gas export. Consequently, there is often a need for a topsides reapplication of scavenger to polish the produced gas to final specifications. If mixing vessels or contactor towers are employed, then such treatments can be significantly more efficient in terms of scavenger performance and usage than subsea application. Design issues with subsea liquid scavenger injection systems include the provision of suitable umbilicals and chemical injection points, and the use of corrosion resistant alloys (CRAs) in conjunction with the use of corrosive scavenger species or byproducts. Topsides application may also require the allocation of weight and space for contactor towers or the use of in-line mixers. Scaling problems with H2S scavenger during gas dehydration processes have also been noted. Solid scavengers, such as iron oxide, zinc oxide, and doped alumina, can be used to react with sour gas passed across contactor beds. These systems are often very good at reducing H2S levels, but replacing the solid scavenger can generate significant health, safety, environmental and disposal issues. For large gas flow rates, the size of the contactor can become prohibitive for offshore developments. For higher rates of sulfide production, the use of solvent recycling systems may become cost-effective. The disadvantages of this approach are that the equipment is associated with high CAPEX costs, high OPEX costs, and large heat and power input. This may require the provision of a larger generating capacity for a platform or the installation of an additional boiler in situations where waste heat recovery levels are not sufficient. The obvious area in which H2S production influences material properties is by the hydrogen embrittlement and subsequent Sulfide Stress Corrosion Cracking (SSCC) of susceptible materials. This is particularly true of fields that were not designed for sour service or were designed for a level of souring that is subsequently exceeded. Whilst the completion, well, christmas tree, flowline and topsides materials may all be placed at risk, an area of particular concern is often the reduction of the fatigue strength of steel catenary risers and top tensioned risers. Increased non-destructive testing (NDT) of topsides components can be used to detect the presence of the microcracks or blistering that may be the precursor to embrittlement failures. Suitable approaches for the detection of such anomalies include ultrasonic testing (UT) and radiographic techniques. It is also possible to use routine maintenance to replace susceptible components in certain situations. The formation of iron sulfide (FeS) scales can generate an increase in local corrosion and pitting. A monitoring regime based solely on the use of weight loss coupons may not be able to detect this transition in a suitable timeframe. If souring increases beyond low to moderate levels, then it is possible for the generation of FeS scale to upset the operation of electrochemical corrosion monitoring techniques, reducing their accuracy and usefulness. An aspect of production system monitoring, that is often overlooked, is the evaluation of bacterial activity. SRB activity in flowlines and separators may generate levels of H2S at magnitudes that can be misdiagnosed as reservoir souring. Regular pigging of flowlines is often required to combat this. It is also desirable for a proactive monitoring and biocide program to be developed for topsides production systems. Areas such as separators, wet oil tanks and slop tanks are particularly at risk of bacterial activity and microbiologically induced corrosion (MIC) and should be monitored and treated accordingly. H2S monitoring has historically been base on manual sampling and the use of Drager tubes. More recently, there has been a move within the industry towards the use of automated monitoring. This has been dictated by two main factors. Firstly, automated testing has the ability to allow the optimization of H2S scavenger usage by comparing injection rates with the levels of H2S produced from a given well. Secondly, such testing can quickly and accurately determine when a well has exceeded its safe H2S production capacity and the well can be shut-in much more rapidly than may otherwise be the case. This is particularly important for fields completed with sweet service metallurgy. 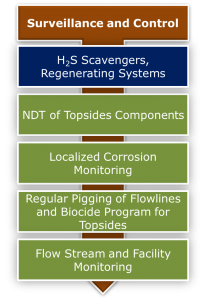 In systems where souring mitigation or prevention techniques are being applied, the opportunity to backflow injectors may be advantageous. In such circumstances, it may be beneficial to make changes to completion design or materials selection in order to facilitate such activities. However, making backflows for the purposes of near-injector souring assessment is only justified in a small minority of cases and is generally restricted to dry tree wells. Fixed H2S sensor systems used for airborne measurements are often much more cost effective to install during platform construction than when retrofitted at a later date. On platforms with a very low assessed souring probability, the decision is often made to install equipment at a later date only if it proves to be required. The impact of waterflood operations on reservoir souring can incur significant production costs beyond those associated with sweet production. These costs relate to more stringent materials selection requirements, increased health and safety management resources and treatment costs to meet gas export specifications. The reactive souring control methods mentioned in this GATEKEEPER often provide a more cost-effective operational strategy for smaller or marginal fields in comparison to proactive souring control measures such as calcium nitrate injection or sulfate removal.